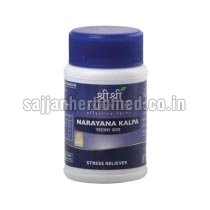 A product of Sri Sri Ayurveda, our Narayana Kalpa Tablets are highly effective in reducing anxiety. Prepared using a perfect combination of herbs such as Yashtimadhu, Shankhapushpi, Shatavari, Jatamamsi, Ashwagandha, Bala, Brahmi, Amlaki, Jyotishmathi, Ajwain, Shunti, and Guduchi, our Narayana Kalpa Tablets are completely free from side-effects and allergies. These herbs act on the nervous system and provide relief from Shrama (Restlessness), Klama (Anxiety) and Anidra (Insomnia). Indications : It acts on nervous system and provides relief from Restlessness, Anxiety and Insomnia. Dosage (Adults) : Two Tablets twice daily before meal.